In this Tutorial we will learn how to use the Boo language to make games in Unity. If you are completely new to Boo, feel free to also read the BooPrimer. Let's talk about the Boo language really quick before we jump into the code. Boo is pretty much Python with types, based on .NET (just like C#). The big selling point of languages like Python and Boo is that we can solve problems with a clean syntax and fewer lines of code. Things like functional programming support, the colon operator (slicing) and ridiculously elegant code are the reason why Boo is awesome. 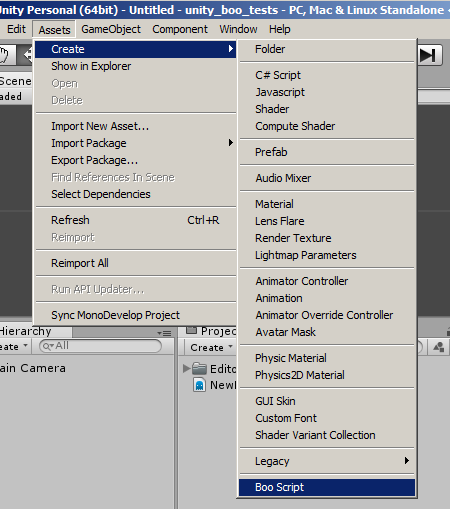 Note: right click the link, select Save As.. and save it in a new Editor folder inside our Project's Assets folder. Note: our Editor Extension that allows us to create a Boo Script is actually written in Boo. Afterwards we will open the Script. Note: It's important to understand that Boo (just like Python) uses indentation instead of curly brackets. Note: the [of Type] construct is the equivalent of the <Type> construct in C#. Note: (int) means Array of int. Please note that we can't make Lists visible in the Inspector (yet). 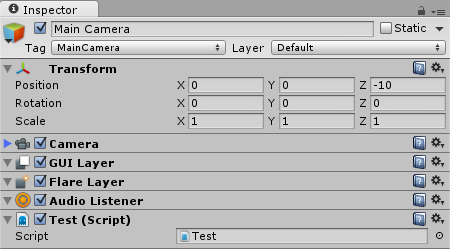 g as string = "test"
# equivalent to "for i = 0; i < 10; i++"
Some of the Unity classes allow us to add our own callbacks so that Unity automatically calls them every few milliseconds. Let's take a look at a few things that can't be done in C#. We only used a few very simple examples with numbers, but it's important to understand that higher order functions are a huge selling point for Boo and any other programming language that supports them. As mentioned above, we can replace every for-loop with map, reduce, filter and function compositions of them. This is what makes our source code so much more elegant and short. We just learned how to use Boo to interact with Unity and we got a first impression of the ridiculously elegant syntax. There are lots of reasons why Boo is a great option for game development. We use a game engine like Unity because we want to focus on developing the game instead of developing the engine. It's the same concept that will make you fall in love with Boo. The language makes our code shorter, more elegant and allows us to focus on the game instead of having to write lots and lots of ugly code. Note: also if you are into functional programming concepts, then Boo is the obvious choice when making games in Unity.